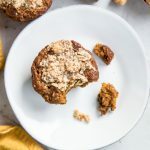 I’m on my third batch of these Gluten-free and Vegan Pumpkin Hazelnut Muffins already this season. 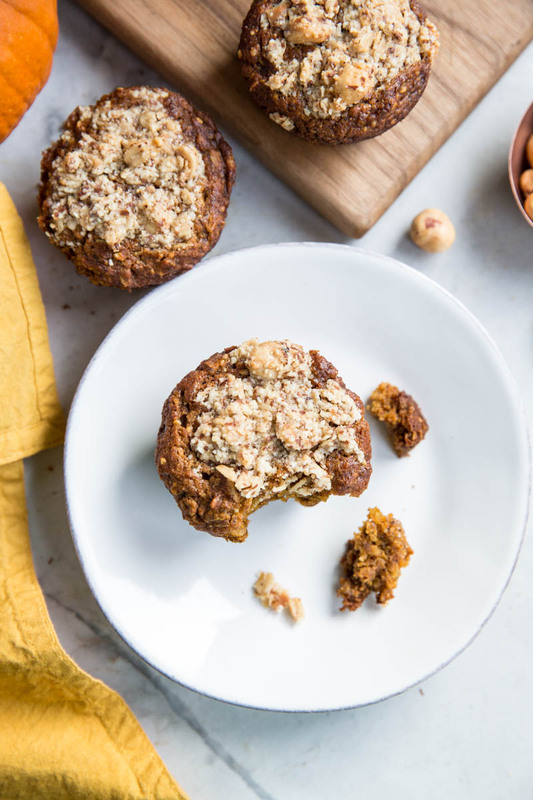 I set out at the beginning of fall to make a perfectly vegan Pumpkin Muffin that was also healthy (this one being both gluten-free and with no refined sugar). Also, I knew I had to include hazelnuts because hazelnuts and pumpkin are a beautiful combo in baked goods. This recipe is what I came up with and let me just warn you, they probably won’t stay around your kitchen long. This fall we’ve been visited by two sets of my most pumpkin loving friends and family. First came my friend from San Francisco, Diana, whom I have known for years (pre-marriage even). When we visit we hardly stop talking, reviewing our latest favorite books, blogs, and podcasts, as well as educating each other on fashion and food (fashion from her and food from me). Diana lives in a beautiful home in Oakland that was recently featured on Design Sponge, raises two lovey young ladies, and makes incredible home decor like mud cloth pillows and wallhangings. Beyond her love for social justice and fair trade fashion, she shares my love for pumpkin treats. So, we enjoyed these pumpkin muffins in addition to some pumpkin ice cream as we caught up. My second visit came from my mother in law, Lana, who’s affection for pumpkin may even go beyond mine. I knew I wanted to stock the fridge full of things she would love including these muffins. When we weren’t reviewing life during our long walks in the park under golden trees, we were smearing pumpkin apple butter onto toast, talking about homemade versions of pumpkin spice lattes, and making pumpkin pasta for dinner. Lana and I share a lot of the same tastes and views which always seems to bring us even closer. Its funny how a love for something as simple as pumpkin can really connect people together in a child-like, or whimsical sort of way. • For the hazelnut meal you have a few options. You can buy hazelnut meal (it’s usually pricey but it’s nice to have around). Find it at most big grocery stores in the baking isle. Or you can buy hazelnuts and make them into hazlelnut flour/meal by pulsing them in a food processor or blender until they are a powder. (This is the route I usually take). When looking for hazelnuts I prefer roasted, unsalted. The roasted nuts always have more flavor and roasting hazelnuts is a pain because you have to remove the skins from the hazelnuts after they roast. • For the flour, if you have a gluten intolerance a gluten free cup-for-cup flour works well in these. I have also used whole wheat pastry flour in these and they come out great either way. • The flax seed meal mixed with water acts like an egg. If you’re unfamiliar with vegan baking this is called a flax egg because it is a binder in baking. • If you don’t have all of the spices on hand use what you have or use 1/2-1 teaspoon pumpkin pie spice. How do you make Pumpkin Muffins using fresh pumpkin? • If you want to use fresh pumpkin, use my easy recipe for pumpkin puree before starting this recipe. • Homemade pumpkin puree is usually a little lighter in color than canned pumpkin so you’re baked goods or soups can come out a little paler in color. • Use cup for cup when using homemade pumpkin puree verses canned. • You may also use pureed butternut squash or acorn squash, like I do with my acorn squash bread. 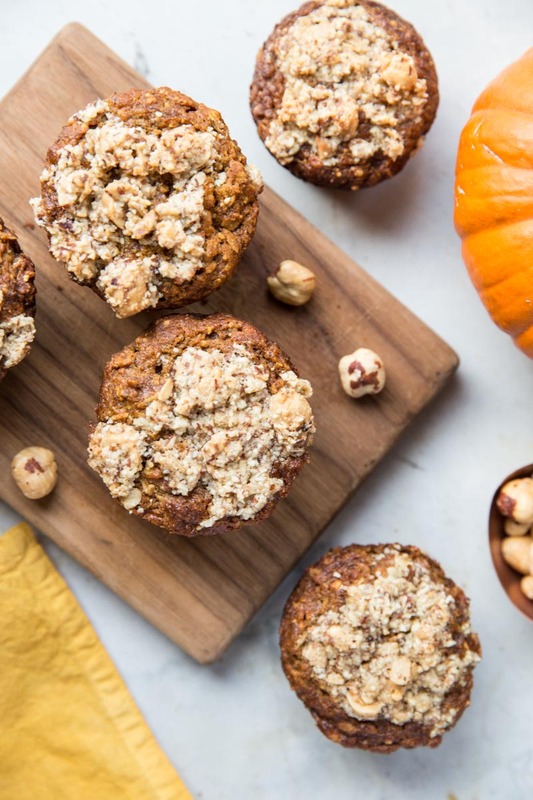 Can you freeze pumpkin muffins? • Absolutely! I freeze these on a baking sheet (for a day or so). Then, once they’re frozen I transfer them to a plastic freezer safe plastic bag. • Let sit at room temp overnight or in the fridge to defrost. Rewarm in a microwave oven for 30 seconds or in a warm oven for 5-10 minutes. • Flaxseed meal when mixed with water becomes a binder (like an egg) for vegan baking. You may also use 1 egg in this recipe instead of the flaxseed water mixture. 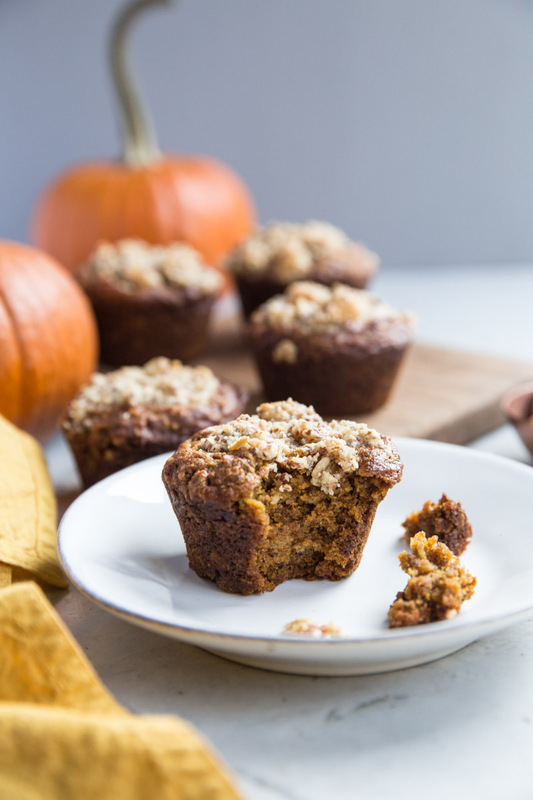 Find someone who loves pumpkin as much as you do and have them over for muffins and coffee this month! 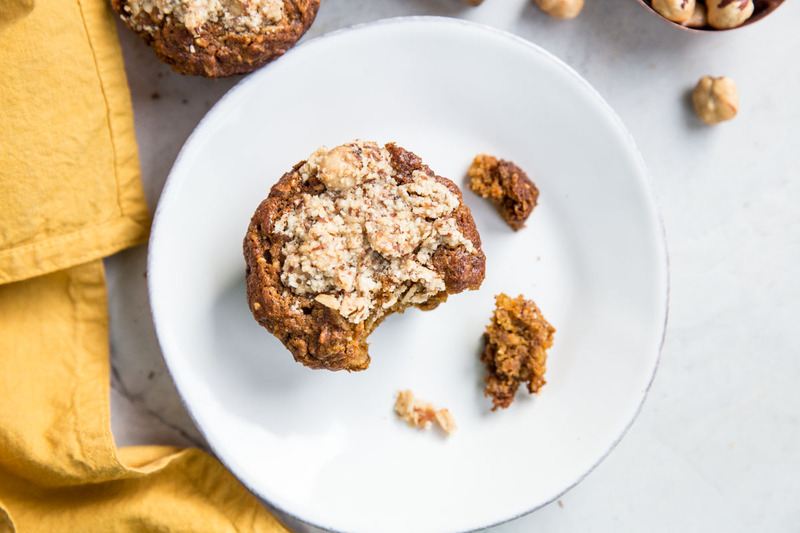 These healthy pumpkin muffins are the perfect breakfast treat for autumn. Preheat oven to 350 and grease a standard muffin pan. In a small bowl mix together the flax and water and let sit for 5 minutes. In a high powdered blender or food processor process hazelnuts to a powder. (I like to measure out the amount for the streusel here too and set it aside.) Don't over blend or you'll make hazelnut butter. Add all other ingredients for the muffins (except oats but including the flax seed mix) to the blender or food processor and blend just until smooth. Stir in oats. Let sit while you make the streusel topping. In a small bowl combine all of the streusel ingredients using a fork. It should have some powder and some crumbs. Use a cookie scoop or spoon to divide the batter out into the muffin pan. Top with streusel. Bake at 350 for 27 minutes. Remove from oven and let cool slightly (5 min) before removing from pan or serving. Store in a air tight container at room temp for 3 day or in the fridge for a week. These muffins also freeze well. You can make hazelnut meal just by pulsing roasted hazelnuts in a food processor or blender a few times until they are a course flour-like powder. If you can find pre-roasted, unsalted hazelnuts those are the best to use! this post was originally published in October of 2017.